That’s it! It appears that the music box has been switched out from Rock-a-Bye Baby to Brahms’ Lullaby, but hopefully she’ll accept the new music since the bear itself is identical to the (very dirty and worn) one she has. Haddie and I want to send thanks to Tami for alerting us of the Kohl’s website and to you for offering this wonderful service! I’m looking for a back-up lovey for my daughter. It’s a Carter’s Musical Crib Toy Bear, purchased at Toys R Us right before Easter 2007. The music box is in the body (not the head as many currently are. The bear is brown plush with a mint green plush shirt, as well as mint green plush inside its ears and on the bottom of its paws. 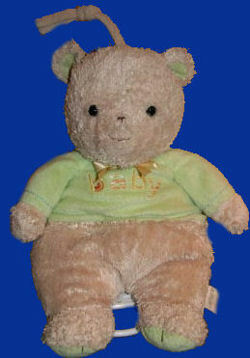 It has a yellow satin ribbon around its neck and says “baby” on the front of its green shirt. On the tag it lists “Style #8540”. It plays Rock-a-Bye Baby when you pull the string. If you can help Stephanie find this Carter’s Rock a Bye Baby Bear, THIS SITE IS NO LONGER ACTIVELY MANAGED. Please use Our FREE FACEBOOK GROUP, including #022808-4 in the subject, . This is online at Kohls.com. I sent an email, in case they are interested in a backup bear.